There is a time in Doctor Who’s history that is celebrated but greatly feared among fans is the changeover from one actor to another in the lead role. Obviously this is one of the things that make’s Doctor Who so unique as a series going back to 1966 when the first regeneration happened from William Hartnell to Patrick Troughton. It is the ability for the lead actor to leave the series he was the star of only to be replaced by someone new. When this happens, the whole tone of the series changes. Not only does the Doctor regenerates but the series does too. As a longtime fan of the series, this sort of thing should be old hat. I have seen every episode multiple times and am very much aware of the concept of regeneration and how it is a new beginning yet I still get nervous. It’s a time for change. What if I don’t like the new Doctor? The biggest news for the series since the 50th anniversary celebrations is the casting of Peter Capaldi as the Doctor. This is really the first time that I was really aware of who an actor was before they took on the role of the Doctor. In fact, when I heard he was a favorite to play the role, I was really hoping he would be cast. Our last Doctor, Matt Smith, who won me over immediately in his first episode was in his twenties when cast. I really liked the idea of an older Doctor but I thought there was no way that Steven Moffat or the BBC would be OK with hiring an older actor to play the role. The success of the series with Matt was very strong and I could not see the BBC bring anyone in who wouldn’t be in the same age range or at least around the same age as Christopher Eccleston for a new Doctor. This was a very nice surprise. 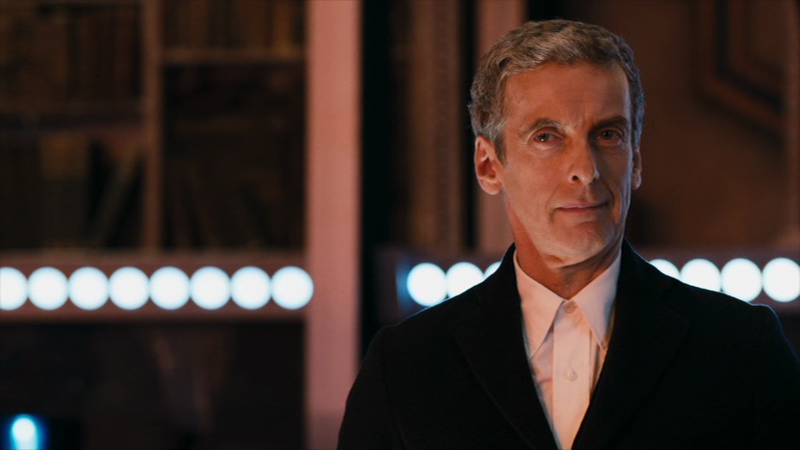 The BBC has decided to make the first episode of Series 8 available as a DVD or Blu-ray disc. 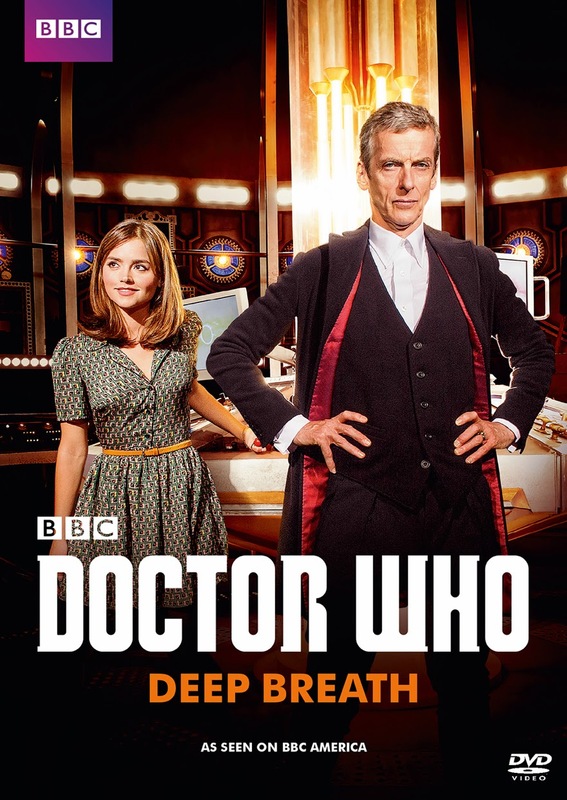 I have to admit that I am a little surprise and unsure as to why we get a release of the first episode, Deep Breath, by itself. Maybe it’s because it is a feature length episode. That being said, I find the release of a standalone disc of a first story of a Doctor a little strange from the new series only due to the current model of releasing season stories in season sets. That being said, is it any different than getting Spearhead from Space released on its own. Looking at it that way, then no. It’s interesting looking at Doctor Who now then from 4 years ago when Matt started. When we watched The Eleventh Hour for the first time, we were not only watching Matt’s first story as Doctor Who but Steven Moffat’s first story as show runner. There was a lot to prove and in my opinion he did so with flying colors. The Eleventh Hour stands, for me, as the most consistent and thought out story to introduce a new Doctor. It is done in a way that checks off all the “new Doctor“ quirks in an episode but in a way that hasn’t been done before. In fact, The Eleventh Hour still stands out as one of my all-time favorite episodes of the series. Jump to 2014 and the Moffat era is well established. Deep Breath now relies on characters that have been established over the last 4 years and like it or not, the tone of the Moffat era is set. The story starts off with a shot of a T-Rex. We see it roaming around only to find that it is roaming London. Not only London but Victorian London. This is classic Moffat, the we see something and each shot tries to outdo the last shot. This T-Rex creates quite the stir in Victorian London but luckily we have the Paternoster Gang of Strax, Lady Vastra and Jenny. As they watch the T-Rex swoop through London, they realize it is chocking and coughs up the TARDIS. When they get down to where the TARDIS has landed they find that the Doctor has regenerated. We get a very lengthy sequence of the Doctor talking to them and speaking to the dinosaur. This is one of many scenes that I feel is way too long. This episode is 80 minutes and there are a number of scenes that I think have a lot of padding to fill that time out. I am sure others will tell me that the extra time is to let the scenes and story breath, and there are moments that do that but overall I think the amount of padding in the story is a lot but also very obvious. 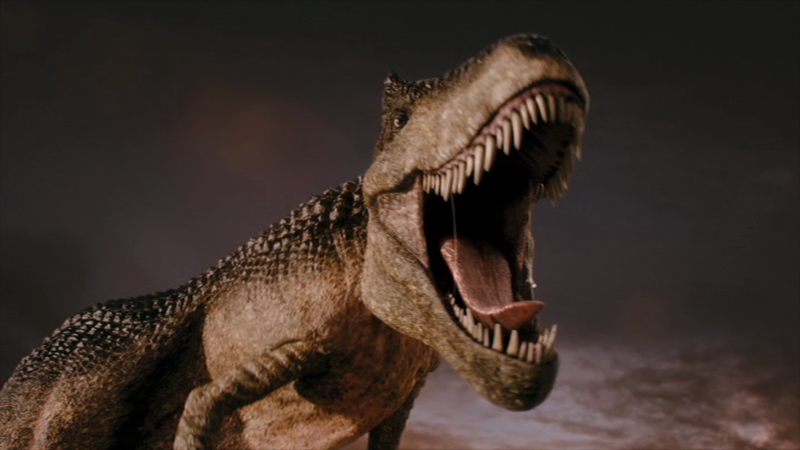 I just want to say that the CG shots of the T-Rex are amazing. This is stuff I used to only think could be replicated in a Hollywood blockbuster but it is a triumph for the production team and they should be very proud of their work. 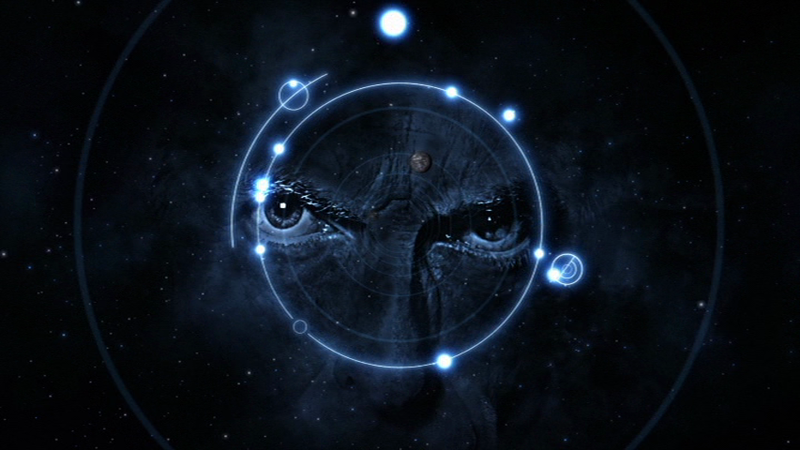 We also get a new title sequence that was influenced by a fan title sequence. I actually think elements of the fan sequence is better but I like the direction they took with this new set of titles. I really like how Capaldi’s face is incorporated into it too. There are some zany over the top moments in this episode such as the Doctor being suspended upside down on a tree to be able to get on a horse galloping past. Now don’t forget, the Doctor speaks horse…….and dinosaur. These are plot points that I know many people lap up but I personally find tiresome. Maybe I’m tiresome or have no sense of humor? Very possible but after 4 years of this type of thing, I am not really overly impressed by it any longer. There is a point that the Doctor and Clara get separated in the story. The T-Rex is murdered and we don’t know why. 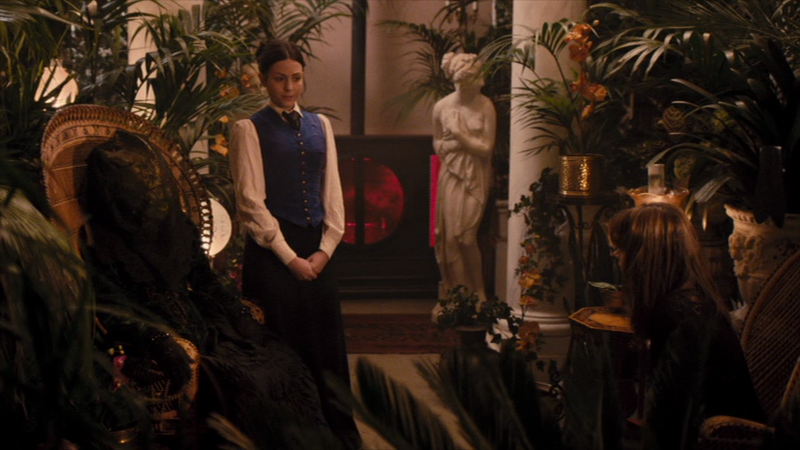 The Doctor feels responsible because after she swallowed the TARDIS, she was transported to Victorian London. He has taken on the “case” so to speak and disappeared. I think this is where the story improves 100%. The first third of the story is a little too quirky and “clever” for my liking. I have a real problem with Clara wanting to know how the Doctor can change back to his previous self. Of literally all the companions to ever travel with the Doctor, she should know what is going on and be able to accept it. I know this is a plot convention to move the story along. I feel a lot of this and other things only serve to prepare younger viewers of the massive age shift in the actor playing the Doctor. I think it may have served the story better if Clara actually had to explain this concept to the Paternoster Gang rather than the other way around. I was actually really disappointed in this aspect of the story. From the time the Doctor ran into the homeless person in the alley (superbly played by the widower of Elisabeth Sladen) Brian Miller to the end the story is much improved. There is a clever bit in the story where Clara is looking for the Doctor and finds an ad in the paper setting up time to meet up with the “Impossible Girl”. Clara meets the Doctor at the restaurant and that scene, to me, is pure magic. There is problems between the Doctor and Clara but the scene plays out as two people who do care for each other. That scene is a highlight for me. I won’t go any further with the plot as this story is so recent that perhaps some people are waiting for this release and I do not want to spoil anything. I don’t feel like this is a very strong opening story for the new Doctor. As I said above, there feels like a lot of padding to make this a longer story. The opening tends to focus a little too much on “funny” gags and it takes a while for the story to get going. 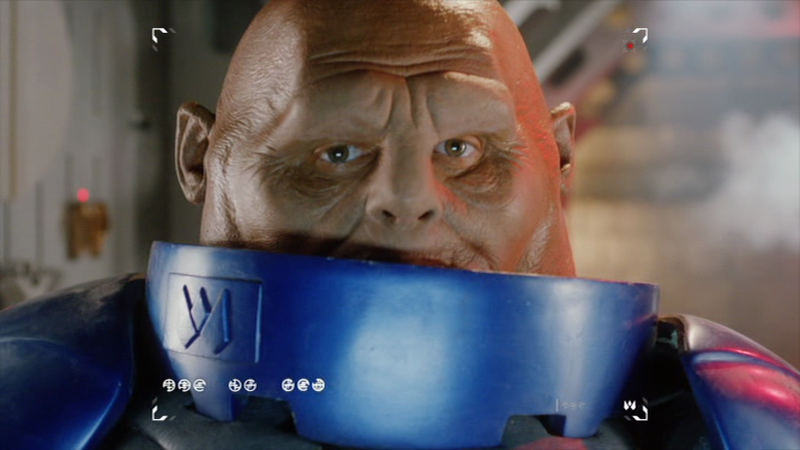 A lot of the Strax stuff like the exam of Clara seem to be filler and the throwing of the newspaper to Clara on the second floor is just a little silly for me. If it works for other people, that’s fine but it’s a little too much for me. Of course the main feature of this story is the introduction of Peter Capaldi as the new Doctor. 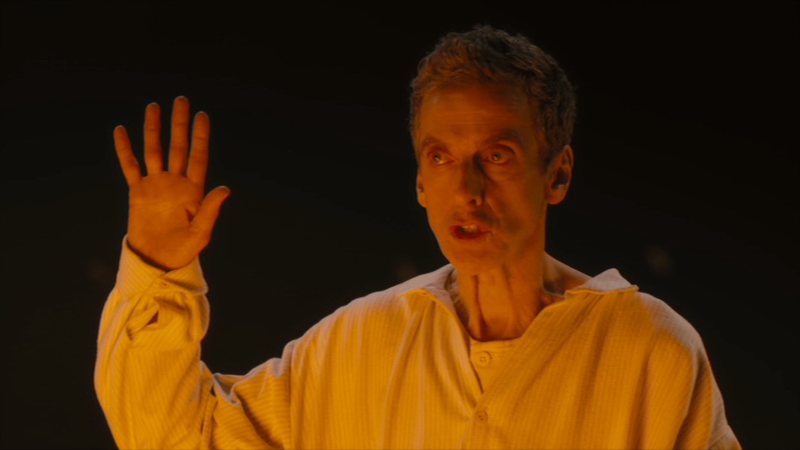 It has become legend now that Peter Capaldi is life-long fan of the series. He wrote into the Radio Times at a young age and clearly is a great ambassador for the series. From the first moment I see him, I am a believer. His performance is engaging. I like how his character is written. He tends to put people down in a nice way but there are moments that he is very serious. I love the scene towards the end where the Doctor offers Half Face Man a drink because the Doctor thinks he will have to kill him. It’s a very Bond moment and kind of sophisticated too. I honestly think he is the only actor from the new series to play the Doctor apart from Eccelston who is able to do a scene like that. He is an inspired choice to play the Doctor. Jenna Coleman as Clara has grown on me quite a bit. I was never really that thrilled with the whole “impossible girl” story line but since The Day of the Doctor, I have felt she is more of companion and character than what I had seen through Series 7. I am not really sure what has changed in her character but I am enjoying her more. She seems to finally have a presence. Then there’s the Paternoster Gang. This is the old classic Doctor Who fan speaking here now. 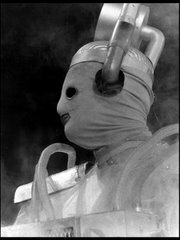 I am not a fan of how some great monsters of Doctor Who’s past has been translated to the new series. The Sontarans have been demoted to imbeciles and the Silurians just look disappointing. I have no problem with them being in the new series nor do I have a problem with them being a gang in Victorian London. The idea of a Silurian (or even the whole race of Silurians) having human eyes and human teeth is unfortunate and makes no sense. It takes me out of the whole possibility that this could be a reptile race. The idea of this gang solving crimes in Victorian London could be cool but I really despise how they are written. Perhaps I am the only person who understands the meaning of the scene early in the episode between Clara and Madame Vastra as she is trying to explain to Clara why the Doctor now looks as he does but I don’t understand the dialogue between the two. I know it is supposed to be a very powerful scene but I honestly don’t follow the dialogue and it leaves me cold. 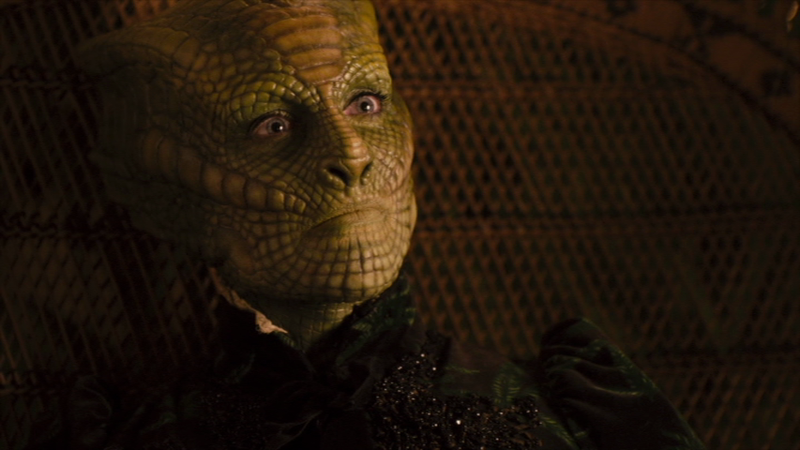 That being said, I do like the idea of a culture where Vastra and Jenny are married. I like the idea that they can each accept each other for who they are but has to live in a time where no one else will accept them as a couple. I think there was a lot of promise for the Paternoster Gang but the execution of how they are written is not very convincing and sometimes just overly comical. Unfortunately, I got a DVD to review and not a Blu-ray. I am not a fan of getting HD material that has been downgraded to SD. So I am not really reviewing this release on technical merit but content. 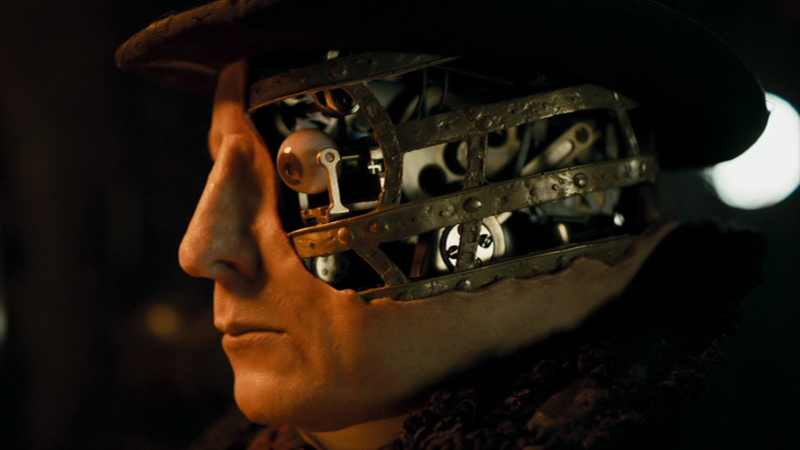 As far as the DVD looks, it looks like a DVD in which the quality of the disc is perfectly acceptable if you want to see this in Standard Definition. There is no glitches or issues with the disc. 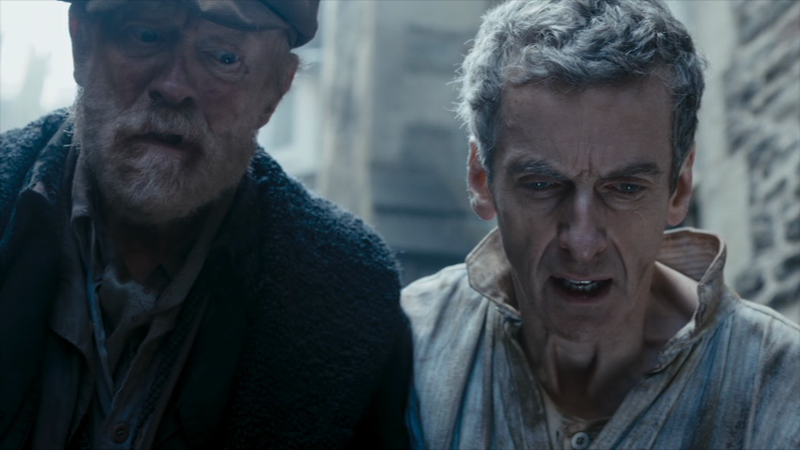 Prequel Scene: I did not see Deep Breath in the theatrical release at theaters around the country which is what I think this scene was used in. I did go to the New York premiere and this was not in it. The premise is some sort of disaster is striking and Strax is on screen giving us an overview of the previous incarnations of the Doctor. This may come as no surprise but I found this very unamusing. He calls some of the incarnation’s women and it is meant in an amusing tone. Trust me, I know this is in the same vein as the character Strax who confuses Clara often as a boy but sometimes it’s just too much silliness. Behind the Scenes: This is actually called Doctor Who Extra. 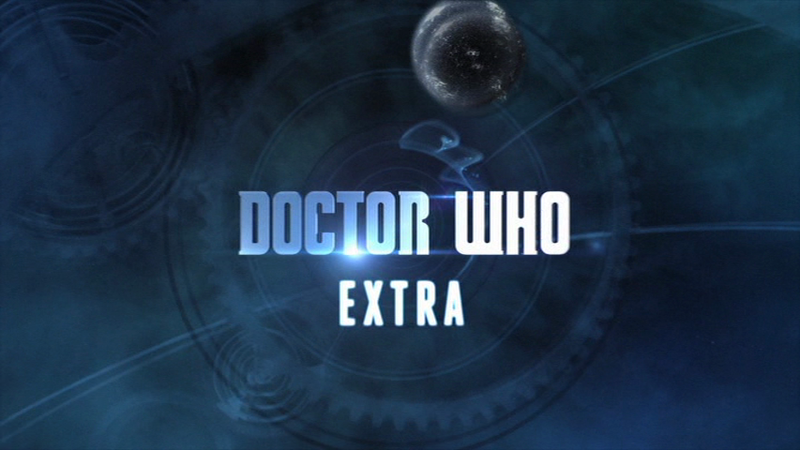 It seems to be the newest iteration of Doctor Who Confidential and it runs just about 10 minutes per episode. I really enjoyed this. The full versions of Doctor Who Confidential became a back-slapping overly congratulatory love fest for showcasing how clever the production team is for pulling off the effects they do. When the “making of” for each episode is as long as the actual transmitted episode, then I think that is a problem. I for one did not see the cancellation of Doctor Who Confidential as a bad thing. This behind the scenes is short and sweet; giving us some glimpse into the making of process without giving away all of its secrets. 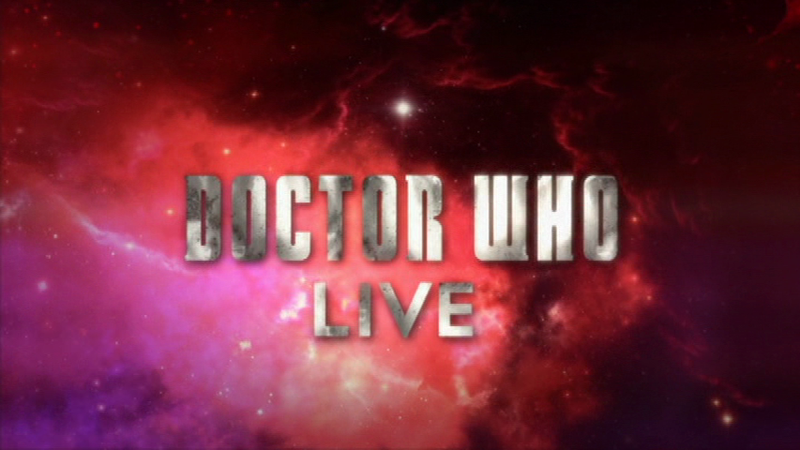 Doctor Who Live: The Next Doctor: As a 14 year old boy, I would have never imagined that the announcement of Sylvester McCoy as the new Doctor would be a worldwide live television event. I would have never thought in my wildest dreams that the world would have been so interested in the new Doctor that we would have a program like this. Now cut to present day: as much as I think it is over the top, I still thought it was done in the right spirit of fun and really enjoyed it. The excitement of hearing Peter Capaldi being named as the Doctor is still exciting to me even a year after it actually happened. Though it does beg the question, for the next time we need a new Doctor, would it be the next evolutionary step to have a reality series made to decide who should play the next Doctor? Should it just be called The Next Doctor? 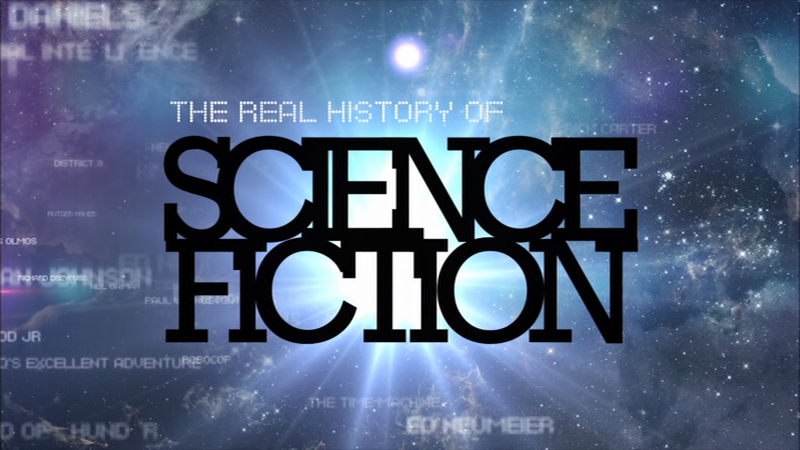 The Real History of Science Fiction: Time. This is an ongoing series and this is episode 4 focusing on time travel. I am impressed with amount guests that appear in the series such as Rutger Hauer, Karen Gillan , Neil Gaiman, Kim Stanley Robinson, Scott Bakula and Steven Moffat. It is hosted by Mark Gatiss. It good and nice to watch. A great deal of this episode features a lot of Doctor Who which is good yet the inclusion of this to the DVD kind of highlights that this is here just to fill out the disc. It was done before Peter Capaldi became the Doctor so there is nothing of him in it which makes its inclusion just a little more odd. I do not completely understand this release. Why is this episode so special to get a rush release by itself so soon after broadcast? Yet, I am clearly the type of fan they are after. BBC Home Entertainment sent me this DVD to review, I still plan on buying the Region A Blu-ray to check out and as I have with everything else, I will end up getting the Region B Blu-ray too. My review may have been a little negative but I still fall into the ranks of whatever I think about these episodes or series I am still and always will be a major fan of Doctor Who.